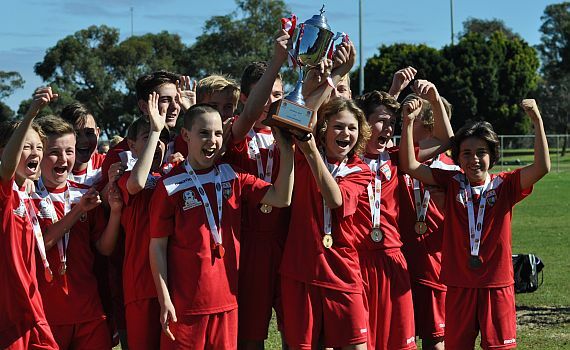 ECU Joondalup under 13’s have claimed the Smarter than Smoking State league Cup Final after a penalty shoot-out win against Perth Glory at Wanneroo Reserve on Saturday morning. Cody Psalia gave the ECU youngsters the lead at the break, but Reece Corrigan levelled for Glory just after half time. In the shoot-out ECU keeper Sam Reilly was the hero saving two penalties to see them home. Riley said it’s great to win the cup, and save the penalties. “A great win for the boys, I was confident going into the shoot out and it was a great feeling to save them and to help us win the cup,” he said. Coach Nik Silsby was over the moon with the performance. “We hit the post and the crossbar and I thought our defence was rock solid, like it has been all season, and they probably got us over the line today,” he said. It was a lively opening by ECU and Saul Morrissey headed wide from Psalia cross, and moments later Massimo Bresciani’s shot from the edge of the penalty area crashed off the crossbar, bounced down on the line and was claimed by Glory keeper Joe Pollard. But on 23 minutes ECU hit the front. Sebastian Gomez sent Psalia down the right, he cut inside his marker and fired home superbly from the edge of the penalty area. Glory almost levelled moments later, Sonny Hennessey-O’Shea shot was inches over the top, before Reilly saved well to deny Ethan Banks. But eight minutes into the second half the Glory did level. Corrigan’s long-range shot flew into the top corner of the net. It was end-to-end football, with both sides having good chances. Aiden Coyne, shot on the turn was blocked for ECU, while Glory’s Nic Santalucia saw his shot well saved by Reilly. ECU went close to the winner on 50 minutes, Psalia’s through ball sent Harry Fletcher clear, his shot crashing off the post and away to safety. So it was on to penalties and Coyne, Fletcher and Frazer Houghton all scored for ECU, while Reilly saved two of the Glory’s. It meant Sebastian Gomez had the chance to win it for the side, and he stepped up finished well to give them the Cup.